I must share with you a story. This week I have been taking some down time at our cabin in NC. On Tuesday we stopped in a local restaurant for some lunch. A voice from behind me spoke and I recognized a former co-worker who has just returned home from the Middle East where he (a former Marine) was assigned as an instructor for a Marine K-9 unit, training and accompaning them on missions. He shared some of his experiences to include being asked to be an assistant to the unit chaplain. His conduct while with these young Marines gave him the opportunity to share his relationship with Jesus resulting in leading some to receive Christ. Next month he is being sent to India and neighboring Hindu countries to train law enforcement members for the US State Department. He explained that when in these countries he tries to establish a relationship with an orphanage and aids them in obtaining items that directly benefit the children that they could not otherwise get. Much of that is books, especially those with a Christian message. I invited him to my truck and retrieved several copies of the Toddlers Psalm 91. He could not believe that I was carrying just what he was looking for. 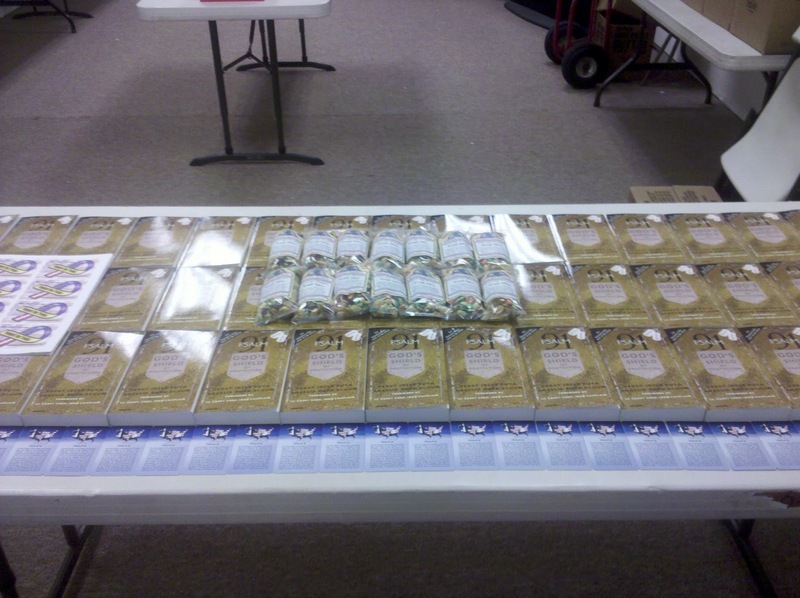 He took two sleeves of Psalm 91 cards to share with military friends and Law Enforcement officers in Bangladesh, India and South Africa. I have told him that if he needs other copies of anything I have given him, ( I had sent a copy of the book earlier) to just contact me. A chance meeting at a restaurant in NC with an old friend, leading to spiritual discussions, sharing a need, and the Word travels to three countries where the people desperately need Our Lord. Thank you for your invitation to me to join with you to share the promise of His protection . This is SPC W_____, Chaplain Assistant for the __ Special Troops Battalion, which is currently deployed to ____, Afghanistan. I would like to thank you and Operation Safety 91 for spending the time, effort, and resources used to deliver the Psalm 91 cards. The soldiers in my Unit and our detachments really appreciate the support and generosity shown by those back home. Psalm 91 does raise the spirits of some of the soldiers and gives them more confidence and courage in protection. Thanks again for all that you do and know that it really makes these deployments easier. Operation Safety 91 attended the Fire Convention East January 21-22 at Daytona Beach, FL. The results: new partners, Psalm 91 cards and books distributed, many invitations to the 4th Annual Tribute to Honor America's 1st Responders in September as well as our new Event in March: a Leadership Conference by COL Danny Mc Knight, USA (Ret. ), Ranger Commander of Black Hawk Down. Firefighters - Junior and Senior! It was an honor to be with so many Fire Chiefs, Firefighters, Fire Support, and families who sacrifice so much to make our lives safer. We pray that you will take Psalm 91 and make it a very important part of your lives! Operation Safety 91 appreciates you so much and prays for you all! “It is my great pleasure and privilege to be the National Spokesperson for OPERATION SAFETY 91 (OS91). 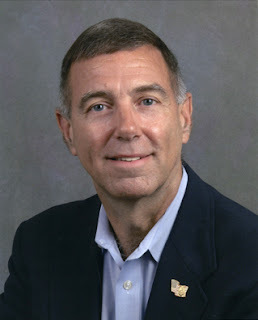 Since August 3, 1973, I have been closely associated with the mission of 1st Responders as that was the day I began a career of 28 ½ years serving our great country in the U.S. Army. Since my retirement from the Army on January 1, 2002, I have continued my 1st Responder commitment to our country and its citizens in many ways. As a nationwide Motivational Speaker I am blessed to speak to thousands of people across the country each year; of my 75-80 speaking events annually, 65% or so are to our 1st Responder professionals. I met a lady from a group that sends care packages to the men and women serving in Iraq and Afghanistan. 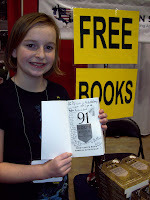 I gave her 50 of the plastic Psalm 91 cards to take with her and also showed her your website. She was so excited. I gave her my card to contact me for more info or more cards. She was telling me that a relative of hers was in some sort of enemy fight where 14 of his buddies were lost. He himself lost his helmet which had a bandana on the inside of it with PSALM 91 ON IT!! Exciting, Huh??!! At any rate I will need more cards! Al... the books you and the Psalm 91 Ministry have sent have been a "HUGH" blessing to many in Puerto Rico. It was really the Lord that you offered them. Thank you for your ministry and the Lord's work through you! We only have literally a few boxes left of the 65 sent! Books have gone out all over the island of Puerto Rico (to individuals, churches, bible studies, orphanages, projects, the Ramey Base (Base Commander and Chaplain have all received individual and boxes of military books which they really appreciated)), Mexico (boxes were shipped by a mission's minded American Airlines pilot friend of mine who recently visited with us to an orphanage his church in Dallas does missions with. Boxes have been set aside to go into the Dominican Republic and Haiti in February. Praise the Lord and thank you again! It's just evidence once again of God's great love for people! We are compiling photos to send to you. We hope to also send some support too. P.S. I have now distributed cards to the California Highway Patrol, San Diego P.D., Escondido P.D., my nephew in Kuwait, serving in the Coast Guard, along with all of the many branches of Military in attendance yesterday. I'm working on it! 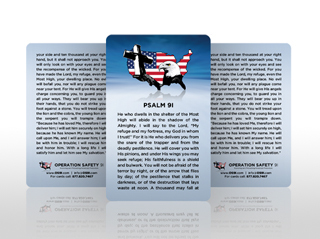 Operation Safety 91 protects 1st Responders by making plastic, credit card size Psalm 91 cards available to them free of charge. Since December 3, 2010, these cards have gone out first to our troops in Afghanistan and Iraq, and then to U.S. Responders all over the U.S. Thank you to all the Responder Chaplains, Organizations and OS91 partners who have made this happen! We appreciate you! 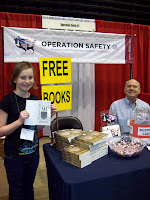 Ed McClelland, Founder of Operation Creekside has recently partnered with Operation Safety 91 to get Psalm 91 books and cards to the Troops overseas. This picture shows the Ps 91 resources ready for packing! Thank you, Ed!